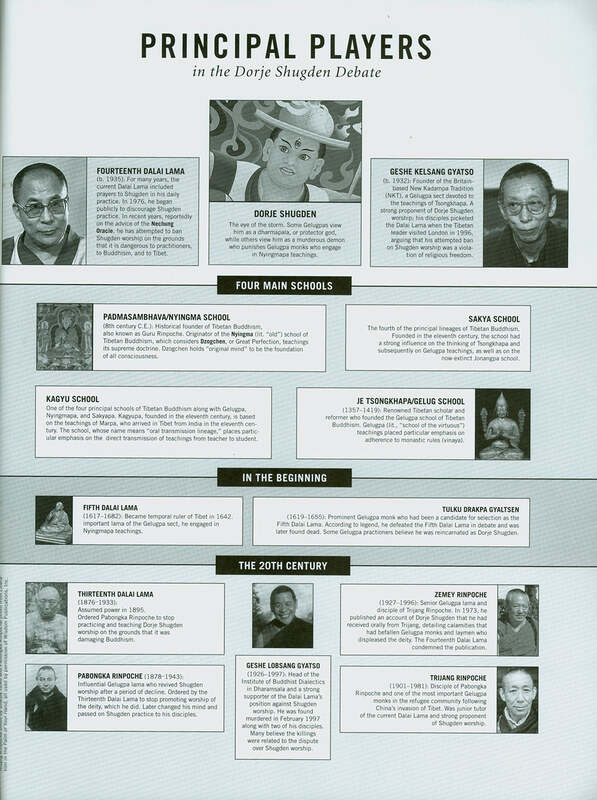 Spring 1998, Tricycle, The Buddhist Review published accounts of NKT's Shugden battles against the Dalai Lama and most Tibetan Buddhists. Shugden worship was never taught by Buddha Shakyamuni or the Tibetan Lamas who introduced (real) Kadampa Buddhism (Atisha and Tsongkhapa), which NKT mistakenly claims to emulate. More than 10 years later, the magazine opened an Internet blog about this disturbing matter (click here), entitled Dorje Shugden: Deity or Demon?. Links at the beginning of Tricycle's blog provide access to the originating articles, including an interview with NKT's founder and principle Shugden proponent and protector, Gyatso, who encourages his students to consider him the purported Third Buddha. As of early April 2009, the blog posts would require 1,492 pages to print the deluge of commentary, much of it ugly. Combined with the immediately previous essay on this web site, few could NOT say that NKT's Shugden battle has cost Buddhism substantial resources, egotistical anger and unfortunate reasons for many to dismiss Buddhism alltogether. Sadly, NKT's battle reporting is far larger. There are tens of thousands of blog posts in dozens of blogs addressing NKT's Shugden battle, including a new one with Tricycle already 140 pages long (click here). NKT's latest attacks claim the Dalai Lama is not a Buddhist, has no legitimate role in Tibetan spiritual and temporal leadership, and is a slave owner. NKT seems oblivious to (or inspired by) the harm it is causing. Tens of thousands of hours of NKT's members and clergy lives are captured by this matter in NKT's fundamentalist and cultish "main practice," the worship and protection of NKT's prime deity, its anger god Shugden. NKTites prefer to worship Shugden sectarianism rather than adhere to Buddha Shakyamuni's teachings. NKT's exhausting battle is interwoven with its tantric specialty and mass tantra 'empowerments', from which dramatic accounts of sexual misconduct have been reported to 'emanate' from Gyatso's highest clergy and previously appointed heirs to NKT rule. NKT's defense strategy: ridicule, attack and threaten litigation against its ex members and clergy banned or traumatized by NKT and against media outlets for covering Gyatso's demonic Shugdenism. When questioned about the turmoil NKT is causing, NKT clergy express their pride. With tears this essay is written.